The cost of living isn’t too horrible in Gainesville, mainly because it’s a college town. Therefore convenience is a major factor in where to live. Most students look to stay as close to campus as possible throughout their four years to avoid any issues of getting to campus for classes. The later you can sleep, the better. Make sure you’re always on your game with housing at University of Florida; there’s a crazy amount of students, and that means a crazy race to get the best housing. Unlike a large majority of schools, UF is so big that freshmen housing isn’t guaranteed. The key is to sign up for housing as soon as possible to make sure you have an affordable spot in the heart of campus. If you are lucky enough to get a spot, most freshmen try to live in Broward, the most social and newly renovated dorm on campus. We’re talking brand new wood floors and closets, actual water pressure and totally redone lounges. 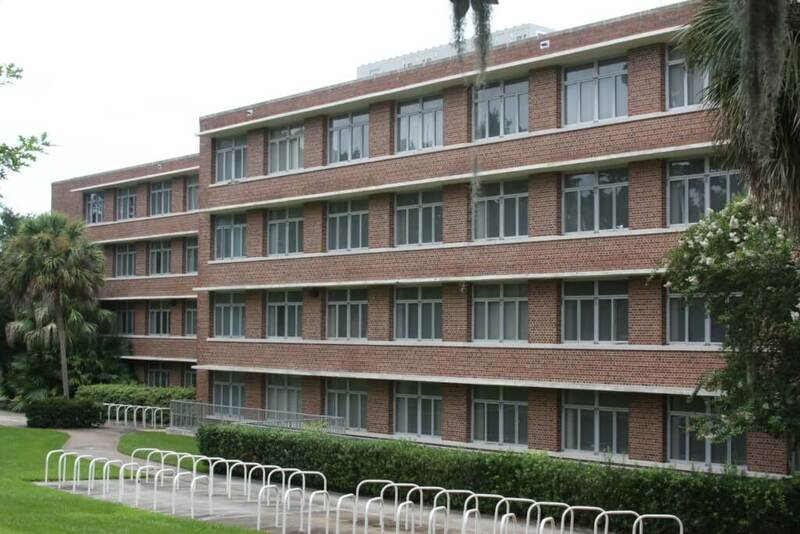 Broward stands out as the most social dorm because each floor has its own lounge, which connects the boys and girls sides, and gives freshmen the chance to make fast friends while doing homework or watching TV. Those who don’t get Broward usually try for Rawlings, which comes in a close second in terms of convenience and social atmosphere. Rawlings is pretty much connected to Broward, so you’re a two minute walk away from your friends. It’s aging quickly, but it also has it’s own personal P.O.D Market that’s open all night and sells every late night craving you could imagine. The second most recently rennovated dorm is Jennings, a quieter and cleaner option that is still in the heart of campus. The only downside to living in Jennings is that everyone will always associate your home with preview, a stressful time before the start of school for all students. Don’t stress too much about your living arrangement, in the end, a dorm is a dorm, and all that matters is having working air conditioning so you don’t melt in the brutal Florida heat. Ironically enough, Sorority Row and Fraternity Row are on completely opposite ends of campus. Fraternity Row impresses from afar, with dozens of stately manisions lining a wrap-around hill. These houses might look nice from the outside, but the inside of each and everyone is absolutely disgusting, no matter how much the pledges clean. Sorority Row spans two whole streets, but not every house is located on row. Each of these houses is more beautiful than the next, intricately decorated and meticulously cleaned. 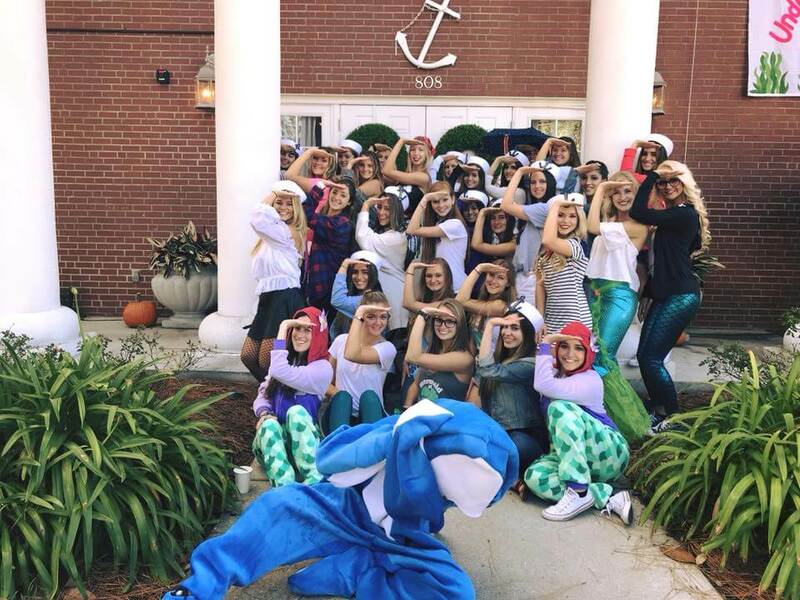 Living in a sorority or fraternity house is an experience unlike any other, but that being said, it’s also an experience that should probably only last for one year. Focusing in a house with all of your friends is virtually impossible. Unless you have Florida Prepaid, there’s really no reason to live on campus past your freshman year. Sophomores confined to the dorms tend to move toward more apartment-style dorms such as Keys or Springs, which are slightly farther from the center of campus. Those ready to take one more step into the real world typically move into apartments or houses behind midtown or behind sorority row. Apartment hunting is just as crazy as the housing process, so start looking as early as possible. One of the more popular apartment complexes is Campus View, luxury apartments located just to the right of Sorority Row but just before the famed DNA bridge, providing the perfect balance between on and off campus. A more afforable option in the same general area is Oxford Terrace II, apartments with similar amenties that are just a little bit older. Those who don’t mind a short bus ride opt to live downtown at 2nd Avenue Centre, which boasts fully furnished apartments and parking for a low price. Apartments such as Woodlands, The Enclave and Lexington Crossing are known for hosting huge pool parties complete with live DJs, free food and free drinks. Those looking for a more homey feel usually choose live in small houses behind Midtown or Sorority Row. These houses are definitely cheaper and making parking easier, but they’re also much older and dirtier. Just when it seems there’s no more room left to build in Gainesville, developers somehow find a way. New apartments and homes are built each year around campus, which means students are always moving around. Instead of dragging all of their belongings back and forth, many students rent out a storage unit for the summer. One of the more popular places is South West Self Storage, located just off Archer Road, one of Gainesville’s main roads. These mini storage units are actually pretty big, so be sure to split them with one or two friends to lessen the cost. Some students in off campus houses will additionall offer their houses as storage space for a small fee over the summer. One of the best parts about living in a college town is that you never have to deal with the pains of furniture shopping. There are dozens of pages on Facebook dedicated solely to furniture exchange, allowing graduating students to sell their barely used furniture to incoming students at a much cheaper price. Some buildings in Gainesville are so old they don’t have elevators, so moving in and out can be difficult sometimes. The thought of lugging your brand new TV up four flights of stairs or more is just miserable. Leave the manual labor to the pros. Whether you go through 2 College Brothers, UF Mover Guys or Gator Moving and Storage, you won’t have to worry about breaking a sweat. You wake up to the chimes of Century Tower and see that you overslept and your 8:00 AM Good Life lecture starts in 10 minutes. You throw on a pair of leggings and grab your laptop before running straight out the door. 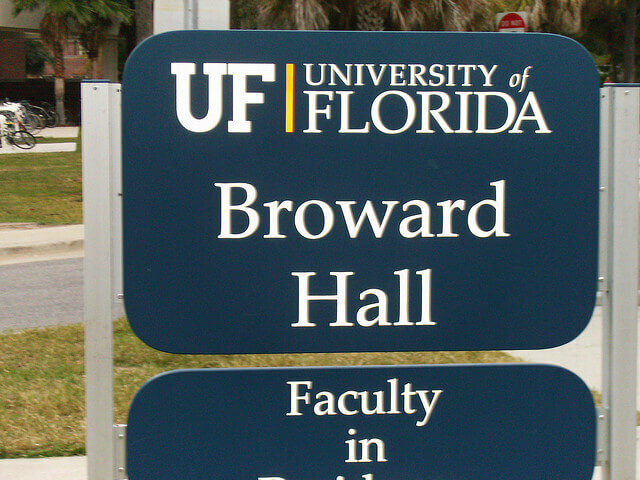 Luckily, if you live on UF campus, your lecture hall is only a short walk away—no . And hey, you might even have a chance to grab a coffee at Starbucks before finding your seat. While living on campus at UF offers unique challenges (we’ve all heard the horror stories of finicky air conditioning units and swamp bugs the size of our fists), most UF students find that they wouldn’t trade their on-campus living experience for anything else. Forget everything you’ve heard about “dirty J.” If you want a social dorm located just minutes from your Astrology 1000 class, sorority row, and Broward dining pizza (hello, freshman 15) Jennings might just make the perfect home away from home. Plus, with lots of like-minded freshman around, making friends comes easily. “I loved Jennings,” said sophomore Melody Dove. “It’s nice to be surrounded by other students who are new to campus so you can figure things out together. Living on campus is super convenient and makes the transition to college much easier.” And while most students associate Jennings with Preview, don’t let a few bland, undecorated rooms and that terrible basement rec room turn you off from the space. Jennings has some of the nicest common areas on campus. It also has a study room that students can use 24/7 when midterms or finals got them feeling stressed. For the social gator, Jennings seems like the perfect choice. One of the newest dorms on campus, Cypress won’t stay one of UF’s Housing and Dining’s best-kept secrets for long. Just a short walk from Norman Hall (something you’ll appreciate after a few Good Life lectures) and right next to sorority row, Gators looking for short commutes and Greek life will thrive. Plus, this dorm has suite-style rooms, meaning you won’t have to fight with 50 other students for the bathroom mirror in the morning. But don’t think that makes the dorm any less social. “I got to make friends that will last throughout my time at UF,” said sophomore Amber Luboff. “If I had lived off campus, there’s a lot of people I never would have had the opportunity of meeting.” And if all that doesn’t already sell you on Cypress, the dorm also has XL full-size beds. Yes, you read that right. FULL SIZE BEDS. This is luxury living, people. Yulee Hall makes it easy to roll out of bed and head straight to the gym, dining hall or your first class. “My favorite part was how close it was to everywhere on campus,” said sophomore Annie Wanzenberg. “It was so easy to walk everywhere.” Whether you want to grab a bite at Broward Dining or head to Marston to study (read: gossip with your friends with your Macbooks open) for a little bit after class, Yulee serves as the perfect home base. 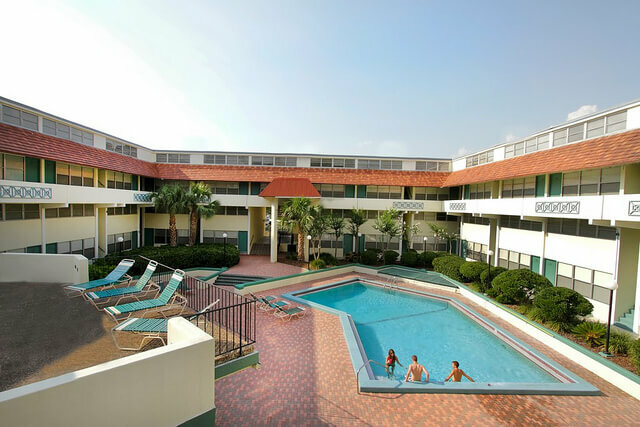 Plus, the possibility of living right next to the Broward Outdoor Recreation Complex and Broward Beach sounds like a recipe for a great tan and a quick dip after class whenever you want. Yulee makes it easy to take advantage of the Florida sun and everything UF has to offer. If the Yulee or Broward Area doesn’t speak to you, check out what the Murphree area has to offer. Just steps from Midtown (read: Fat’s and Tijuana Flats), Gators who want the close-knit feeling of on-campus living and quick access to the outside world and great Gator nightlife will thrive in Buckman Hall. If the possibility of midnight runs to Relish or study breaks at Grillfresh doesn’t make you want to immediately sign that housing contract, maybe the old-timey southern vibes of the historic Murphree area will help you make your decision. UF sophomore Lara Disuanco agreed. “There’s a beautiful garden in front, a wonky but funny fountain,” she said. “My overall experience was awesome. I made a lot of great friends in the Murphree Area and the Area gov rocked.” BRB, signing our housing contracts ASAP. If you don’t want to worry about your air conditioning breaking in the middle of the August heat or think about the possibility of mold growing on your ceiling, check out Hume Hall, home to the Honors LLC. While the residents keep the volume lower than what you’d expect from students at one of Florida’s biggest party schools, the dorm’s proximity to ChompIT (hello, chicken tenders) and frat row nearby make up for the quietness for extroverts. Plus, the dorm offers some of the nicest private study rooms on campus, perfect for when you need to teach yourself a semester’s worth of lectures. Oh, and a word of wisdom for anyone considering living in Hume next fall: “If you plan on living in Hume, invest in a scooter or just be prepared to walk a lot,” said sophomore business major Grace Pepple. “Hume sits on top of a decently large hill,” added sophomore Stephanie Strickland. “Your quads will feel it.” Sounds like a great way to combat the freshman 15 to us. If Freeform filmed a college movie on UF’s campus, they’d probably set a lot of it in Graham Hall. After all, it looks like the quintessential college dorm, complete with shared bathrooms and spacious double rooms. Staying up all night gossiping with your best friends looks like a scene from your favorite sitcom. But the best part of Graham isn’t its prime spot right next to frat row and the Reitz Union, although these things definitely can’t hurt. Graham Hall sits right on top of the Pod Market. That means tons of late night snacks and your room becoming the designated hangout after a night out thanks to the burgers and fries available until 3 a.m. from the ChompIT downstairs. “I went in my pajamas for Ben & Jerry’s all the time,” said sophomore Bianca Cegatte. “I liked how convenient it was to grab food or any necessities.” That sounds like the perfect living situation to us, too. Students either love or love to hate Lakeside Complex. Located right near Lake Alice, the Bat-House and Southwest Rec (meaning tons of opportunities to get totally fit, or tell yourself you will while actually gorging on Chick-fil-A fries), you won’t exactly feel like part of the hustle and bustle of main campus. But what Lakeside lacks in the perfect location, it makes up for with amenities that will make even those living in the Standard jealous. “My favorite part about living there was the fact that I had my own private bedroom, a full kitchen, and a bathroom that I had to share with only one other person,” said sophomore Makayla Nicholas. Living apartment-style means students get more personal privacy but also have the opportunity to share common space with their fellow Gators. If you aren’t sure about committing to UF off-campus living but still want your own space, consider Lakeside your new home. Can’t wait to see the basketball team take the court, or watch as the Gators Gymnastics girl gang sweep another couple SEC medals? Does your fall semester revolve around football season? If you can’t get enough of sports, whether playing or spectating, consider Tolbert Hall. After all, Ben Hill Griffin Stadium and the newly renovated Exatech Arena sit right down the road. Even if you don’t feel like cheering on your fellow orange and blues, Tolbert still serves as the perfect place to stay active on campus in between lectures and hanging out with friends. “Tolbert Hall hosts the ROTC LLC,” says sophomore Anna Iraiarte. “You can even ask if you can run with ROTC members early in the morning.” If this all doesn’t make you want to put Tolbert as your #1, the dorm also sports large communal kitchens and gives you the option of choosing a single, double or triple room. More independent Gators will shout, “Yes, please!” to the choice to live in Infinity Hall. With its floor to ceiling windows and colorful modern furniture, Infinity Hall looks more like an upper end apartment complex than a UF dorm. Plus, Infinity comes with tons of options: single suites, double suites and super suites all located right next to UF’s Innovation Square, about a 15-minute walk from the heart of UF campus. But don’t let the commute scare you away. “I always took a bus to class or walked,” said sophomore Kat Fiorentino. “I thought the commute was really easy.” Students also have access to 3D printing facilities right in their own residence, thanks to the innovative Maker Space and creative labs. There, students can collaborate and work on projects across multiple disciplines. 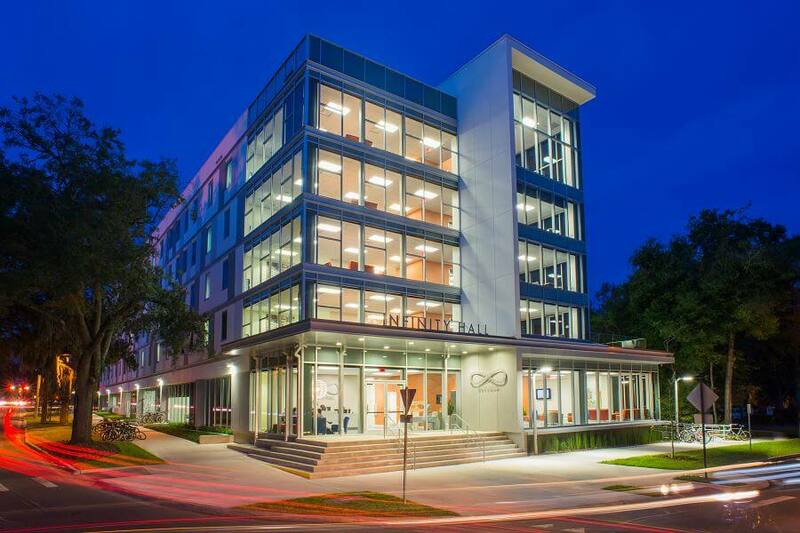 If making new discoveries and printing out the plastic parts necessary for your newest passion project sounds like your ideal on-campus living experience, consider Infinity Hall your new home away from home.